Create a perfect display for your 3ft x 5ft flag and accompanying certificate or medals. Ideal for storage of flags flown over the Capitol along with certificate, this Flag Display Case includes a precut mat to fit a standard 8 1/2-in. x 11-in. certificate. Simply remove the mat to configure as a shadowbox for awards, medals, photos and other keepsakes. 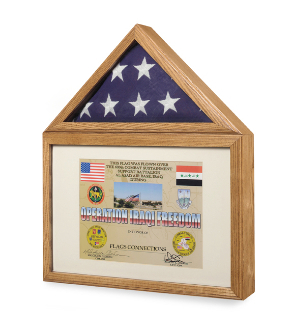 Our Flag Display Case comes with both blue and black background and material and instructions for easy mounting of your items. A high-quality glass pane fronts the display, and on back of both the display and flag case compartments are turn button closures. This box is designed to be hung on the wall, but can be placed on a shelf. The overall size measures 21 in. tall x 17 in. wide x 3.5 in. deep. The Flag Display Case’s box section measures 10.25 in. wide x 15.5 in. tall and 2.38 in. deep, and the flag compartment is 13.75 in. x 6.75 in. x 2.38 in. 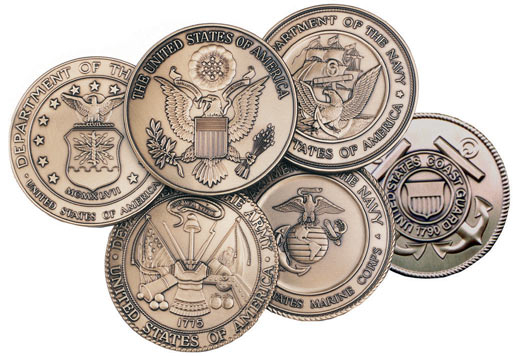 Our “made in the U.S.A.” displays are made with a sense of pride and respect for craftsmanship. Quality always saves more than it costs so don’t settle for poorly fabricated alternatives. Our items are crafted in genuine hardwoods, material as durable as it is attractive. Our flag display cases are perfect for displaying flags from all branches of the military and other public services, such as police and firemen. The right flag display showcase not only shows off the beauty of what’s inside, but keeps it preserved and secure as well. This box Part is 10.25 inches wide X 15.5 inches tall and 2.38 inches deep. Orders for the Flag display case - Flag shabox, flag and medals Caseare usually shipped out within one business day to places within the USA and Canada.